Ett sovrum, två badrums lägenhet som rymmer 5 personer. Oceanfront med utsikt! Detta nyligen ombyggda ett sovrum, två badrum lägenhet ligger vid Sapphire Beach. Sängar 5 bekvämt eftersom vi har en king size-säng i sovrummet, soffa som konverterar till en king size-säng och en tvilling storlek konvertibla kärlek sits. Denna lägenhet ligger bara några steg från den vita sanden och det lugna vattnet i Sapphire Bay. Vi ligger på östra änden av ön nära staden Red Hook. Platsen är perfekt som det går gångavstånd till marina där du kan boka en segling resa, BVI dagsutflykt, fiske, jet ski hyra och många andra aktiviteter. Denna lägenhet ligger i gated Sapphire Bay West Condominium komplex och är perfekt för en perfekt tillflyktsort. Det finns en pool, tennisbanor och tvättmöjligheter på plats samt strandstolar och lounger tillgängliga för gäster på stranden. En hårtork tillhandahålls. Badlakan, handdukar och tvättdukar finns för upp till fem (5) gäster. This condo worked out great for our family of 4 (2 adults and 2 teens). It was very nicely updated inside and had everything we needed during our stay. The location was great with easy access to the beach just a few steps away. The beach was perfect...great water, nice sand, plenty of shade, and food and rental equipment all close by. Good area for snorkeling too. The condo is located close to the town of Red Hook, so an easy drive to many restaurants as well. The owner was great to work with and provided all the necessary information needed before and during our stay. Would definitely recommend this property as a place to stay when visiting St. Thomas. The property was perfect! It continues to make a “comeback” from the devastation from the hurricane. We so enjoyed our stay. Our unit was clean, well stocked and very close to the beach! Thank you Deborah, we are so glad you enjoyed your stay. Hope to see you again sometime! This property is well kept with access to Sapphire beach within 30 sec walk. The condo is very nice with a comfortable bed 2 showers and a full kitchen. More than enough for 2 couples or a small family. The Sapphire beach bar is very close with full bar, food and live music. Also the owner and his help that lives onsite are very helpful if you have issue. Highly recommend this location. Great property. Clean, nice grounds. Friendly staff. One minute walk to incredible Sapphire Bay Beach. Beautiful salt-water pool. Owner was very responsive. Everything we needed for a fun, relaxing vacation and great for our three kids. We'd love to come back here again! Amazing Condo at Sapphire Beach! We had an amazing experience staying at Sapphire Beach! This condo is the perfect place to stay on St. Thomas. The condo itself is immaculate. Up-to-date with tasteful beach decor. It is spacious and comfortable. The location of the condo is awesome. Everything you need is just a short walk down to the beach. We had no issues each day walking straight down to empty chairs waiting for us with plenty of sun and shade under beautiful trees right on the beach. The beach is unbelievable with super clear turquoise water and white sand. If you like to snorkel like I do there are two reefs on each side of the cove and out of the several spots I snorkeled on Saint Thomas this spot was the best. The snorkeling here had the best visibility and the most fish. There are also squid, spotted rays, and sea turtles. Beach rentals are available close by. There is a really nice bar with great drinks and good music on certain days. They serve the best painkillers and fish tacos on the island. There is also a coffee shop close by that has a small store in case you forget something. 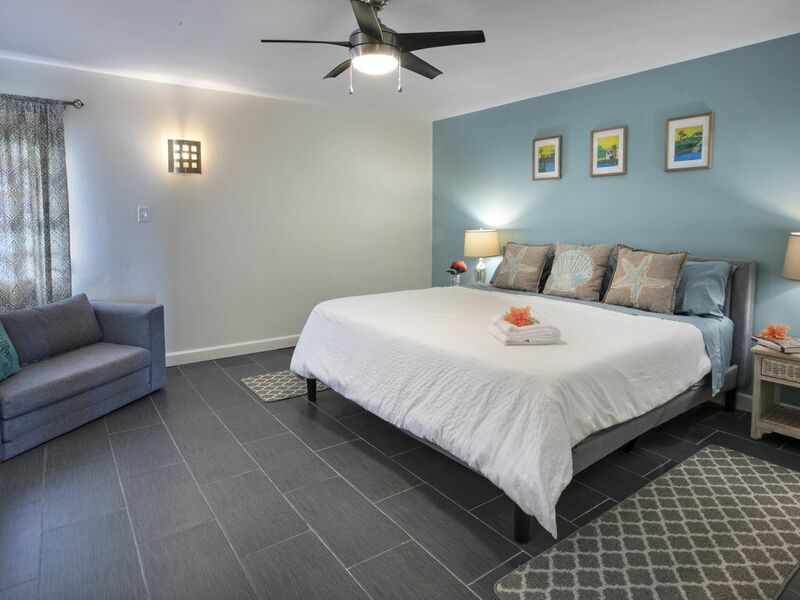 Many of the excursions leave from the marina which is also walking distance from the condo which makes departing for your excursion really convenient A short drive from the condo are plenty of great restaurants, bars, and an ice cream shop and grocery store. We will definitely be back to stay at this condo again! Highly Recommend! Thanks for sharing your experience, we are glad you enjoyed the condo. We would love to host you guys when you come back! Superb condo! The unit was extremely clean and very comfortable for a family of 5. Just as advertised. Very short drive to Red Hook which made it very easy to catch the ferry to St. John. Will definitely stay here next time! Platsen är idealisk för semesterfirare som stranden ger en hyra för strandleksaker och andra aktiviteter. Den närliggande hamnen och strandrestaurangen / baren är också bekväma platser att gå till. Staden Red Hook har allt du behöver, inklusive mat, färjeterminal, restauranger och nattliv. Du kan ta taxi här för $ 1 per person!